The climbs across the lake are very inspiring, Banks still has some gems left that we will be looking for in future seasons; as well as the surrounding Coulees. It was good to run into you and glad you got on Zenith. We had a pretty good laugh when one of your partners asked "how long we were staying?" and our reply was "until it warms up" it was worth sharing just for the look on her face. See you around. Vern, we knew you were trying to find out the name a couple weeks before we climbed it- glad you did. Did you find out who put it up and when? just curious. Thanks for the write up Marlin. You put a lot of effort into the tr. Here is a video of some of my stuff. Has anybody made an offer? 100 bucks. I've been in AK since the 31st of March and have not been following the weather down here. Does anyone know if the North Side of D'tail is holding up? Looks like freeze-thaw this week and I might be able to sneak in and would like to back-to-back this and the Gerber Sink. 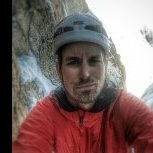 Get a guide and find an appropriate adventure to your ability (IMHO there is a ton of BS in clubs, many people use it as an ego trip and a dating service). 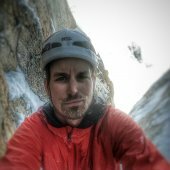 Maybe an alpine multi-pitch in the 5.9 realm. Tell him/her what your into and that you want to learn. You'll be able to be in an environment where you can soak it in and be safe. Basically learn from a pro then seek like minded partners (I'm of the Twight school of thought on partners- its sacred in the Alpine) That being said I'm self-taught like many others, but the learning curve took a bit longer by doing so. Shoot I'd love to have Barry Blanchard guide me around a day just to hear the stories. 2 cents. DIY Synthetic bag styled like the FF Vireo ? Thanks I'll check that out. DPS- We started it last night. Zipper is out hood is chopped off, got to bring in the sides and sew it up. About 4 hours into the project. I'll post up a few pictures later tonight. Carrying your water on alpine objectives? Where do ya find that tape? I just googled Sigatape and a roll of it costs about as much as a new thermarest. Whats the name of the 3M version? Which side of the state are you on? Has anybody figured out a way to patch the platy's? I emailed Nalgene but they just offered to send a new one. I was thinking about those quick bike tube patches or maybe tenacious tape, but I don't want to poke a hole in my new play just for science. I've never given thought to the small .5L Nalgene's but I'll be getting one. Thanks for the insight.